We will take on transport and repair costs upon presentation of an invoice if the breakdown is covered by the warranty. 12.1 - All products are covered by the manufacturer warranty. The Company cannot be held liable in the event of delay caused by a supplier stock shortage. 12.3 - In accordance with the legal texts currently in force, the Company protects the Customer against all consequences of hidden defects in the item sold. The Customer is expressly informed that the Company is not the manufacturer of the majority of the products offered according to the definition in law no. 98-389 of 19 May 1998 pertaining to liability for faulty products. 12.4 - Defects in the Item which become apparent within 24 months of delivery of the Item will be presumed to have been present upon delivery, unless proven otherwise. This time period is reduced to 6 months for second-hand equipment. 12.5 - Within the framework of its warranty extensions, maPlatine.com extends the warranty for certain products (turntables, phono preamps, headphone amps and record cleaning machines) to 5 years under the same terms and conditions as offered by the manufacturers. -A completed returns sheet as provided below. The following breakdowns are not covered: Purchase of cartridges – belts – cleaning products – brushes – stylus etc. More generally, all consumable products. Please note that problems arising after transportation of an inadequately packaged product will not be covered under the warranty and will be invoiced along with the labour. Transport and repair costs are the responsibility of the customer. 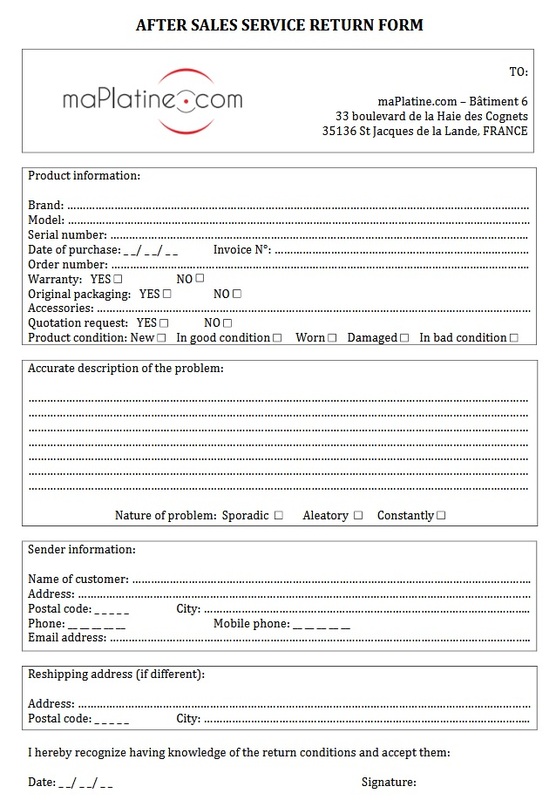 Please complete the returns sheet below and tick the box on the form requesting a quote. A quote will be drawn up and offered to you before any action is taken.